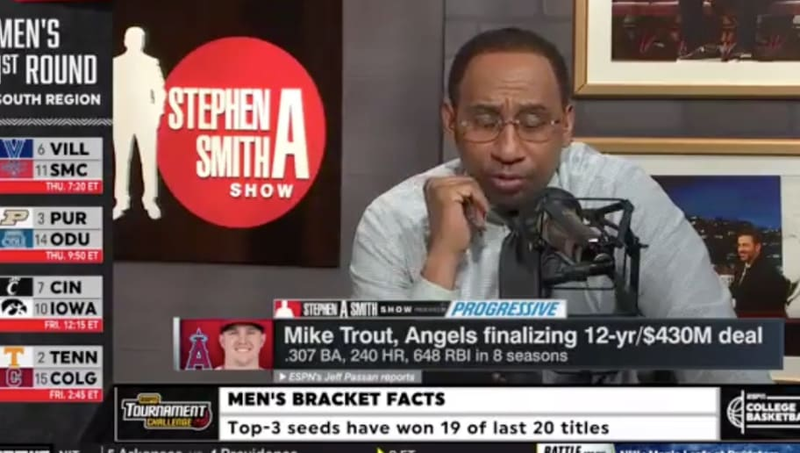 ​Since the news of Mike Trout reportedly finalizing the largest contract in US sports history with the Los Angeles Angels (​12 years, $430 million) broke, the ​sports world has been going bonkers...and apparently, Stephen A. Smith of ESPN's 'First Take' has been, too. Stephen A. apparently asked ESPN's Jeff Passan Tuesday afternoon about how Mike Trout's mega-deal will affect ex-Angels Manager Mike Scioscia. Likely, it won't at all. Scioscia, who was the manager of the Los Angeles Angels from the 2000-2018 seasons, stepped down after the 2018 season and seems to be done with managing for the time being. Stephen A. 's comment showcases his recurring lack of sports knowledge at times, reporting and making claims on matters that are not true or relevant. For someone of his stature and prestige, we can't have that. Most notably, Stephen A., in December of 2018 on First Take, attempted to describe some of the key matchups in the upcoming Chargers game. He remarked that the Chiefs will have to watch out for tight end Hunter Henry, who was injured for the entire season with a torn ACL that was suffered in May. Stephen A. promptly followed up his first blunder with another, stating that he was excited for the matchup between Henry and Derrick Johnson. Johnson was not on the team at the time of this comment, released by the Chiefs in March of 2018. Come on, Stephen A. No more of this.